Treatment takes between 30 minutes and 1 hour. There is no recovery time so you can carry on with your usual activities, although you are advised to avoid high impact exercise, hot baths, saunas and sunbeds for two weeks and waxing for four weeks. You will also need to wear support stockings for 72 hours after treatment and during the day for a week after. 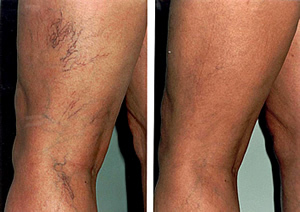 In most cases the veins will permanently disappear but new veins may appear in other areas of your body over time. The injections are almost painless – you may feel a slight pricking sensation as the injections are being performed. After treatment the skin around the vein may appear pink and blotchy, and a small bruise may be visible at the site of treatment. 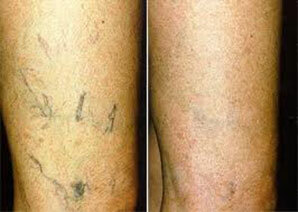 The veins may look worse immediately after treatment and large blood vessels may become darker in colour. The veins will start to fade after 3 weeks and it will take 3 months before the full results of the procedure are seen. Complications from the treatment are rare but can include venous thromboembolism, visual disturbances, allergic reaction and hyperpigmentation. If the solution is injected properly into the vein, there is no damage to the surrounding skin, but if it is injected outside the vein scarring can occur. Your practitioner will discuss the procedure and possible side effects with you in detail during your free consultation. Before treatment you need to avoid aspirin, vitamin E and Aloe Vera preparations for at least 10 days. If you suffer from varicose veins you will need to be assessed before your treatment can be planned. Call us to arrange a free half hour consultation to discuss your requirements and the most suitable procedures given your medical history and the results you’re looking for. 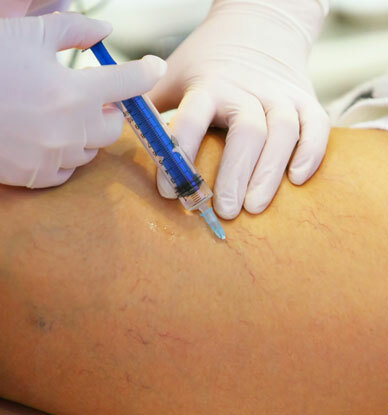 Want to know more about Sclerotherapy – Thread Vein Removal for Legs?